My niece has cancer. A week or so ago she began hospice care at home. At that time she was alert, I was able to get her from bed to wheelchair, to the kitchen table. She took her meds, ate breakfast, we joked around. She’s famous for her laugh. Rough day today. No details, except to say she is bed-bound and not communicating verbally any more. She gets agitated. We can only guess what is wrong. I suppose it is natural to have rough and calm spells in a declining process. Like a stock market graph in depressive times: small ups and downs as the market steadily tanks. It is difficult to stay focused. As with many episodes of life, one cannot appreciate all ramifications while still in the experience itself. Today’s sketch captures a brief respite in the world of a caregiver. 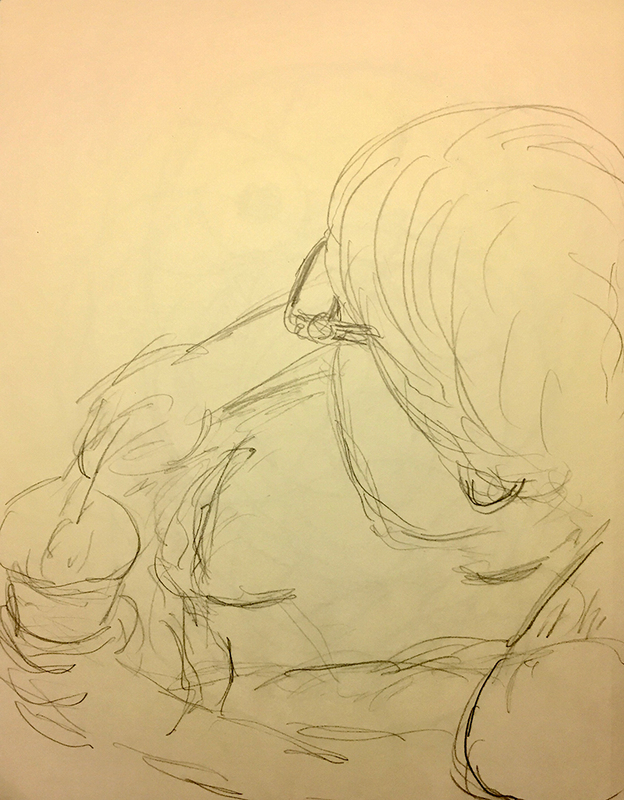 This entry was posted in Personal Stories and tagged artistic process, cancer, caregiver, communication, creative process, creativity, illness, portraiture, processing, sketching. Bookmark the permalink.